BigAnt Corporate IM is specially designed for office communication. Key features. 1. No more MSN Messenger, no more ICQ, get rid of these efficiency killers from your company now to boost office productivity. 2. Create clear organization Units, all employees and managers have clear view of their team, you can not do this with free instant messenger, typically MSN. 3. Send group message to all the members of one group, or some of them in the team, 4. With your own server, your own network, the file transfer speed is ultimate high, no more frustrate of sending files failed via MSN. 5. Send offline message, or files, or even send an entire folder, you can send any type of files,no size limit. 6. Get Receipt of read messages, you will get a receipt of delivered message.7. BigAnt client is very ease of use, similar to MSN. 8. BigAnt server is easy to be installed, just simple click, click, click, and it is also easy to create new group, team and members. BigAnt Instant Messenger is an instant messenger with business features, BigAnt Instant Messenger raises the level of collaboration and community for relatively low cost.Please visit http://www.bigantsoft.com/im/demo/demo.html for more features. 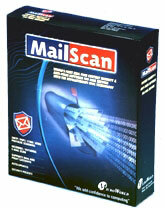 MailScan 6.1 for LAN-Projekt WinProxy is the world's first "Real-Time" e-mail scanner for the WinProxy Mail Server. This server is published by LAN-Projekt. The price mentioned is for single user. Kernel Exchange EDB Viewer tool is an eminent utility to open EDB files of the Exchange Server. The robust and output driven utility is available for free download and allows users to access the EDB files instantly and easily. SiteRecon providing email monitoring that continuously checks your mail server and subcomponents, such as virus protection and content filtering. If mail is not being processed, SiteRecon will immediately alert your that a problem exist. The modusMail mail server provides all-in-one email services, messaging security and spam protection. This anti spam mail server comes bundled with everything you need to deploy email to your organization. AXIGEN Mail Server - a complete messaging solution for Linux,BSD,Solaris;offers (E)SMTP/POP3/IMAP4/Webmail services,Groupware,Personal Organizer,Push email & PIM synchronization with mobile devices,centralized WEB/CLI admin,FREE technical support. This site does not contain serial number, crack, keygen BigAnt Corporate IM serial number : serial number is the simplest type of crack. A serial number(cdkey,product key,etc) is register the program as you may already know. a crack or keygen may contain harmful software. If you cannot find the exact version you want, just give it a try. for more information read .nfo/.txt/.diz file include in zipped file.